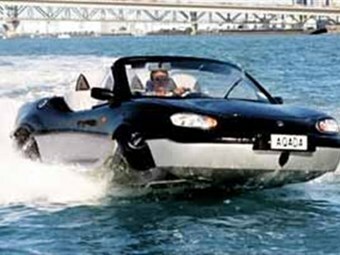 It doesn't come with ejector seats or dashboard-mounted martini mixers, but in every other respect the amphibious Gibbs Aquada lets you live the 007 dream. All you need is courage - to drive it into the sea. Lawrence Schäffler slipped into the cockpit. Bond would love it. A high-performance sports car that's equally at home on the water. Essential for eluding heat-seeking missiles and sinister arms dealers - and irresistible to damsels in distress. Yes, amphibians have been around for quite a while, but the Aquada is not your typical amphibian. It's a particularly successful hybrid that not only slips between road and water seamlessly - it also looks sensational, with a performance to match. On the road it boasts crisp acceleration, sharp cornering and a top speed of more than 160kph: the same characteristics are evident in the water, where top speed is around 50kph. Though it's built in the UK by Gibbs Technologies, the Aquada is also a distinctly New Zealand story. Company boss Alan Gibbs is a New Zealander - and the craft's major breakthrough - its sublimely elegant, retractable suspension system - was invented by a New Zealander. While it made a brief appearance in Auckland about a year ago, the Aquada has for the first time been released to the New Zealand media for detailed examination. For public viewing, it's on display at this month's Auckland International Boat Show. Gibbs Technologies is a New Zealand and British-based engineering company specialising in the design of high speed amphibian (HSA) technology. 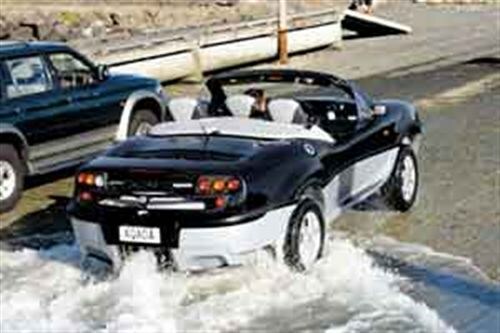 Gibbs has always been interested in amphibious craft and in 1995 came across the retractable suspension invention of Manukau engineer, Terry Roycroft. He purchased Roycroft's patent and stepped up the development of HSA technology. To do that, he employed some of the world's best automotive designers and engineers, and established a manufacturing base in Nuneaton, Warwickshire. By 2000 the team included Mike Giles (chief engineer, previously with Jaguar), Pete Dodd (general manager, formerly of TWR) and Professor Jim Randle, (formerly engineering director of Jaguar Cars and Jaguar Sport). He also appointed Neil Jenkins as managing director. Jenkins' career as an engineer, designer and businessman encompasses aerospace, satellite and high performance aircraft technologies, defence vehicles, 4WD vehicles and trucks, limousines (for Rolls Royce) and luxury sports cars. Jenkins led the design, engineering, tooling and manufacture of the Jaguar XJ220 and the MGR V8, and last year was awarded the UK's Prestigious Churchill Medal by the Society of Engineers for the HSA systems developed by Gibbs Technologies. This high-calibre crew has delivered handsomely: since its formation in 1996, Gibbs Technologies has patented more than 60 inventions relating to HSA technology. As might be expected, the Aquada demands some fairly radical engineering, no-compromise corrosion-proofing, and watertight design. 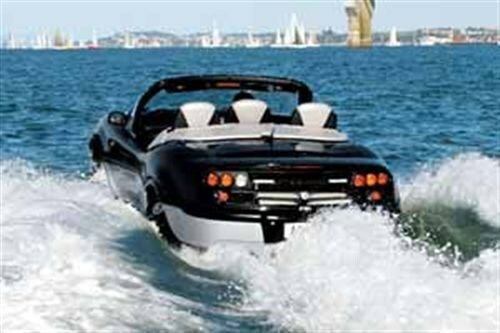 An unusual combination of automotive chassis technology and boat building, its composite construction features aircraft-grade aluminium, carbon fibre, fibreglass and stainless steel. The basic "hull" is a one-piece, fibreglass and aluminium bonded space frame. There are no doors (helps to prevent leaks) and the residual buoyancy makes the Aquada unsinkable. Minimising weight has been a major consideration, as is evident by the alloy KV6 engine - MG-Rover's 175hp, 2.5-litre, 24-valve V6. Mounted mid/rear, the engine's directly behind the cockpit and is completely enclosed. The jet's a proprietary Gibbs unit. It too had to be lightweight and compact, able to expel one tonne of thrust, (the force required for the Aquada to plane). It's 890mm long and weighs 40kgs. Most jets producing that sort of thrust, says the company, would be twice as long and wouldn't fit the Aquada. Overall the craft weighs around 1.5 tonne. Arguably, the key feature of the Aquada is its retractable suspension - crucial for eliminating hydrodynamic drag. A beautifully developed piece of engineering, the simplicity of operation belies the technology behind it. The suspension itself is a conventional wishbone set-up at the front and a five-point design at the rear, but there are 17 valves in the computer-controlled, hydraulic strut system. It's a remarkably versatile piece of equipment. The strut acts as a self-levelling spring, a shock absorber and a bump stop. It's a device for increasing ground clearance when in road mode. And ultimately, it's the device for raising the wheels out of the water. 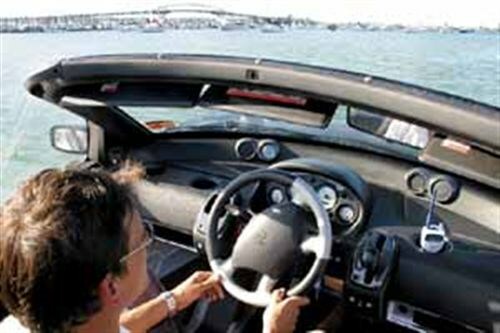 As the vehicle enters the water, the driver simply presses a button to trigger the vehicle's four-second transformation. It all happens automatically. Hull-mounted sensors recognize the craft's in the water and in the appropriate depth. Engine drive to the wheels is suspended, the wheels are retracted and the jet unit kicks into action. Trim tabs are deployed to an optimized position, and road lights change to marine lights. Leaving the water, everything happens in reverse, with computers again safely controlling the extension of the wheels and switching from jet unit to road transmission. Transmission for road operation is a conventional, automatic five-speed box, with purpose-designed clutches that carry the drive to the wheels through the retractable driveshafts and suspension. It's quiet and effortless - very tidy. Superbly. It's a low-slung machine with racy lines, and with no doors one simply steps over the side from conveniently-placed running boards. It's equipped with a single, three-abreast padded seat (driver in the centre), and you feel as though you're sitting in a sports car - rather than a speedboat. The three-seat configuration, incidentally, equips the Aquada for skiing: driver, skier and observer. The tow point's fitted to the middle of the transom/boot. Instruments are grouped centrally in front of the driver. They include the usual car components - speedometer (works for both land and water), rev-counter, hour meter, fuel gauge and temperature gauge. There are two foot pedals - accelerator and brake (the latter is superfluous for water mode). The only non-car controls are the switch for the retraction and extension of the wheels and two sliding buttons that set the trim tabs. Floor the accelerator and the V6 responds instantaneously, boosting the Aquada on to the plane in seconds. She's fast and stable. Steering is exceptionally light, with chines and strakes providing good grip when cornering. The hull also carries a flexible keel fin for directional stability. Sitting fairly low on the water, I anticipated a soaking, but rails and chines disperse the spray either side of the vessel efficiently. We stayed completely dry - even when we hit the Fullers ferry wake. Green water washed over the bonnet and was deflected smoothly by the windshield. Well, actually we did...er... take on some water - only when we were performing high-speed, jet boat turns - to test the vessel's manoeuvrability, of course. Yes, it is very agile. Clever integration of road and marine components are evident everywhere. There are grab-handles on the windshield rail and cleats for mooring ropes on the car's flanks. A hood - a light canvas Bimini - deploys for shade and keeping foul weather at bay. Most impressively, the designers have managed to conform with a maze of regulatory requirements - meeting road and marine standards. Consider the running lights, for example. No green light is permitted on a car's exterior, but a starboard light is compulsory on a boat. Red lights signify the port side of a boat - but the rear end of a car. A white light shining backwards from the mast is mandatory on a boat but rear-facing white lights are forbidden on a car. Port and starboard running lights are mounted on either side of the Aquada's number plate, and a "steaming" light is quickly erected on a tower just behind the cockpit. Is the Aquada a practical vehicle/vessel? Who would use one? Well, as Gibbs believes, amphibians are particularly suited to large cities built around water. "They're all congested, all have infrastructure problems, and they're all short of solutions. The application of amphibious technology to everyday vehicles - cars, buses and trucks - will offer new options for transport planners and commuters in water-based cities such as Auckland." Gibbs expects to license the technology to other manufacturers for use in a diverse range of applications, both private and commercial. I can see it would be a marvellous antidote to the daily snarl-up on Auckland's harbour bridge. It provides the freedom to move easily from one medium to the other without towing a trailer, without having to return to where you parked. 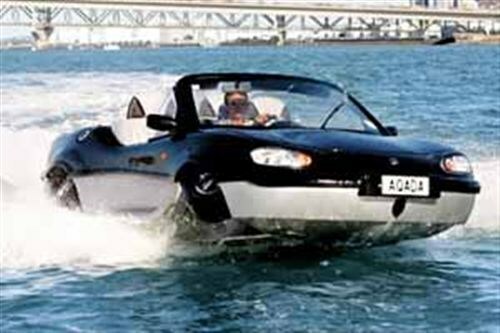 Even better, it has the added attraction of allowing you to indulge in a bit of water skiing on the way home from work, just to clear your head of office cobwebs. In the Bond idiom, driving an Aquada is an experience that leaves you shaken and stirred - and unquestionably will boost your chances of meeting a bevy of beautiful women. Sadly, unlike 007, I'd have to admit to being married...and drive off without them.